A year ago the Northwest Multiple Listing added a property search feature for “green” certified homes. Home buyers can now search specifically for Built Green, LEED, Energy Star or third party verified Built Green homes. From these new search categories there is accumulative data from the NWMLS that shows the “green” trend and where it is going. 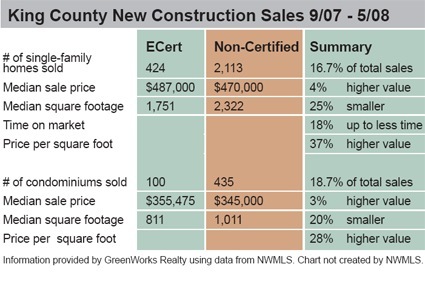 Green Works Realty compiled the data to show the true sales value of a green home. This chart shows that going green does sell! During these tough times finding features to distinguish a home from another can make the difference in a home selling or not. Adding green features to a home may make that difference. The compelling data shows that a “green” home tends to sell for 28% higher price per foot and in 18% less time than an average home. So, what are you to do if your home was built before “green” was a popular term? Join Listing Boot Camp Saturday, September 13 at One Earth One Design and hear what Sandy Campbell owner and designer of this innovative sustainable lifestyle store has to say. Sandy will discuss ways to add green features that help a home sell. It can be as simple as using no VOC paint or going with a permeable walk way versus an impermeable one. It may also be incorporating staging pieces like reclaimed wood furniture. To find out more and receive useful resources join us this Saturday!